After watching the long-awaited London Olympics 2012 Opening Ceremony and one cup of instant coffee, I was bouncing around until 7 AM this morning and woke up after snoozing a mere 4 hours. My fault, my fault yes. But the good thing is FASHION RECAP is here! Four years ago the Beijing Olympics were about the ooh-ahh-fireworks and waiting forever for the USA and Chinese teams to pop up in Parade of Nations but this year my eyes were glued to the tube for what the athletes donned as they strutted the stadium. These are not the best images since NBC was the only channel allowed to cover in the US, so we make do with blurry snaps from my phone or scrounged from online sources with credits listed. If you missed out, the Opening Ceremony is very British (as an American I simply can't understand some nuances, so basically movies like Trainspotting involve my mouth hanging open in front of the screen for several hours and still not getting it) and quite fun. I'm sure all sorts of clips are available on Youtube and NBC.com. Favourite moments? Mary Poppins army with their light up umbrellas, swing dancing docs and nurses, Olympic Cauldron coming together, and of course, Her Royal Highness. So what if Ralph Lauren makes his stuff in China? 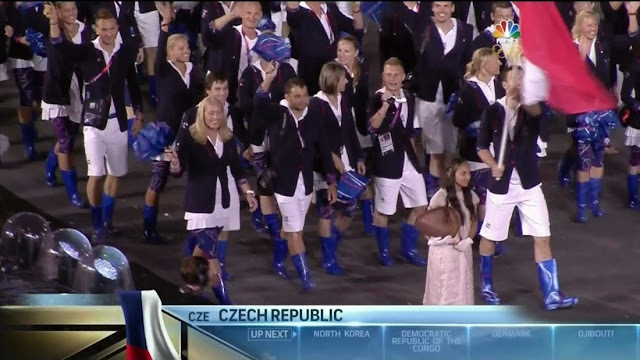 Looks like the USA team of 500-plus-strong walked straight out of a prepster catalog, but lookin' good. I especially enjoy the double breasted blazers that the guys had, which looked good with their little berets and white pants. The womens' white skirts were floppy and unshapely, why not give them trousers too or at least put some pleats in it, RL. And give them fitted double breasted blazers too next time. Kobe looking sharp in his beret and rounded collar. 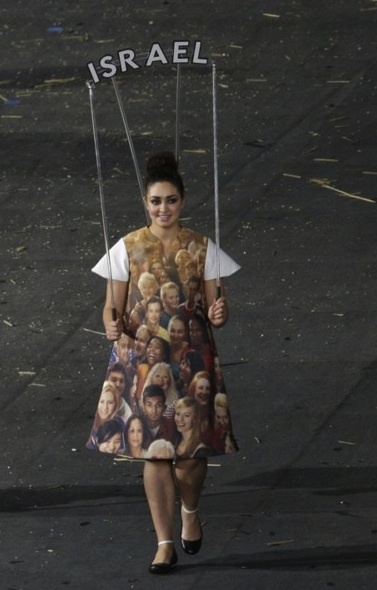 The country name-bearers wore super cool dresses with faces of volunteers from each respective country. Also digging the wire signs and font choice. 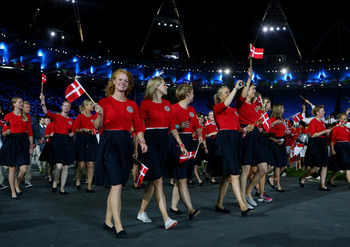 Denmark did right with their retro mod buttoned cropped red cardigans and navy midi skirts. Classy and classic! Other notables: India's women athletes looked gorgeous in their bright yellow saris, Nigeria's white and green was refreshing but not overdone, the rounded-bottom hems of Latvia's white blazers. Liberia, Jordan, Netherlands with their contrast trim blazers. White sheath dresses from San Marino were very chic and the men looked equally suited (pun intended). David Beckham smirking in his gorgeous suit, nuff said. Sorry to hate, but seriously, Czech Republic? Rubber galoshes/rain boots/Wellingstons whatever you want to call them with weird swirly patterns, matched with knee length spandex tights of the same pattern? 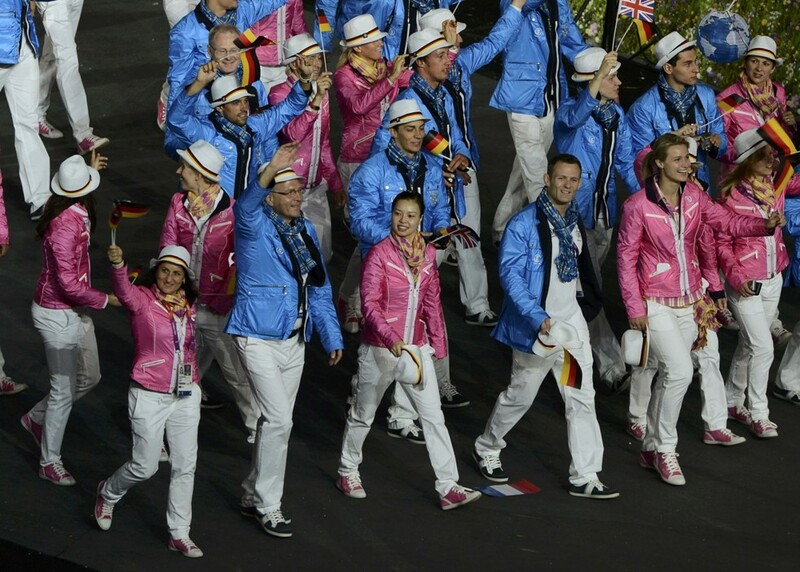 Germans and their bubble-gum-pink-for-the-ladies, baby-boy-blue-for-the-gents, mildly shocking for such it's a boy/girl! gender labeling. Readers - did you watch the Opening Ceremony? What do you think of the show and fashion? great photos!!!! your blog is great... please come visit my blog and let me know if you want us to follow each other ok! Didn't watch the ceremony but I feel like I did now. per informative post, and quite hee-larious as well. SuAnd I kinda wish I really had. Must...youtube. The opening ceremony was rather boring, for me. Apart from the fireworks, Mr Bean, and Bond, I didn't really get the rest of it. It was slow and there were a lot of taped portions I didn't get. But then again, maybe I'm just holding it to a high standard b/c Beijing was da bomb. I mean, that will go down in history, I think. Anyways, moving to the fashion -- you are certainly right that many of them weren't fitted for their "uniform". And why floppy skirts on the RL USA women? How about a flattering pencil skirt? And whaddap with berets. Eck. And BOO for only NBC covering the event. Blah. Same old commentators. I did love the plaque carriers! And Denmark was cool, if not "flight attendant" like though. Bubble gum colors for Germans was certainly a fail. Have you ever seen Project Runway design an Olympic uniform?! Now THAT was awesome. Oh wow, Denmark's outfit is so cute! And here I thought that none of the uniforms would impress me. While I do admire many of the blazers and more prep-designs, I wasn't exactly bowled over by any of them, sad to say. I must have missed Denmark's entrance!